In mid March I spoke at State Records’ regular Records Managers Forum about what you need to do to implement effective social media recordkeeping in your organisation. Podcasts and slides for each of our presentations are on the Future Proof Podcast page, but I thought I would post a short summary of some of the key points from my talk here. I started with a quick overview of the Queensland Police Service’s use of social media. The Queensland Police Service (QPS) has a fantastic case study on their website, Disaster management and social media – a case study. 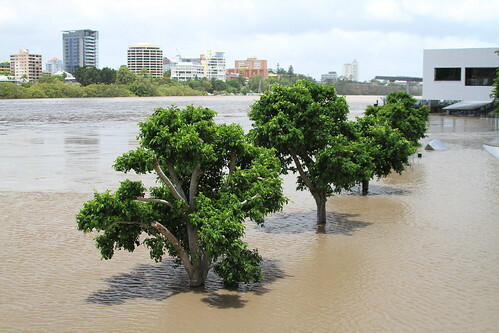 This case study charts the public impact of the QPS social media presence during the 2011 flood disasters in Queensland. The statistics in the case study are amazing. In the 24 hour period following the flash floods in Toowoomba and the Lockyer Valley, the QPS Facebook page generated 39 million Facebook impressions, which equates to 450 post-views per second (as cited on page iv of the case study). The case study shows how, throughout the flood crisis, the mainstream media was relying on the QPS social media accounts for its news. People stranded in isolated areas were reliant on the QPS social media broadcasts and were able to communicate with emergency services via these accounts. Police in disaster-affected locations relied on the QPS accounts for up-to-date awareness of the flood situations in their area. The QPS #mythbusting hashtag stopped many rumours and disinformation from circulating. Police also provided 24/7 moderation and enquiries response via their social media channels so the community was always able to access up to date, accurate information about the flood disasters. The QPS case study is a wonderful example of how social media can provide an incredibly powerful interface between government and the community. Social media is a tool that can connect government services directly with community needs. Social media platforms will therefore become increasingly significant business environments for all sorts of government operations. And as this transition occurs, we need to ensure that these government operations continue to have the information they need to support them. If you use social media, how to you manage and most effectively use the information you generate? Firstly, you don’t need to manage everything. Some social media information will be important to your organisation and to the community you are serving and some will not. The key is to be strategic and to know all the ways your organisation is making use of social media. how many social media accounts are out there? are there any rogue accounts that appear official but which are really the views of one guy sitting up on level 2? is there any account governance? Businesses run on information and by extending your information governance frameworks to the social media environment you will help ensure that all your business needs for information, now and into the future, will continue to be met. assess your client information needs and expectations, as well as public accountablities that are dependent on your business information. is high risk or strategic business moving to social environments? are business or client management decisions being made or communicated? are internal processes that were formerly supported by defined processes or workflows now moving to social? will our clients rely on the information we are posting to our social channels? will our corporate reporting or accountabilities rely on the information we are posting to social? will be want to reuse any of the content we are moving to social channels? If you answer yes to some or all of these questions, your social media operations will need to be supported by a good recordkeeping framework. Some initial technologies that can help you to make and keep records of your social media business operations are listed in State Records draft social media recordkeeping advice. Remember when are considering social information governance that social media is more than Twitter and Facebook. Wiki use is growing across government because of the flexibility, coordination and reach that these tools offer. If information governance frameworks are not established in wiki environments, however, the key business information in these environments can be completely inaccessible to those in the organisation not directly involved with the technology. When you are investigating technologies you should focus on finding a solution that best meets your business needs. Information governance and recordkeeping frameworks in social media environments should not be focussed solely on compliance. That is, the driver for good governance here should not be, ‘State Records says that we need to keep a record of it all’, but specific business drivers instead such as ‘This business area needs this information to respond to client enquiries’. You may find that you may need different recordkeeping strategies for different social media channels. This is discussed further in the State Records guidance. Recent case law and e-discovery considerations are emerging as new drivers for better information governance in the social media environment, and good recordkeeping processes can be key supports here. In some government organisations that we have been speaking to when developing the social media guidelines, a tactic that seems to be working is account specificity. By having specific rather than general Facebook pages and Twitter handles some organisations are able to better handle information flows, recordkeeping responses and are able to ensure that relevant business information generated by social media is fed directly into the business areas and processes that need it. Considering legal retention requirements at the outset can also be a useful tactic. By knowing how long you need to keep information for, you are better able to plan what social media information needs to be captured and how it should be managed. Other recommendations relate to privacy by design. If you have identified that your business processes need some of the information that is being generated by social media, your social policies should publicly state you will be capturing and keeping the social media information you need to support your operations. With your social recordkeeping strategies you should also try to minimise the amount of personal information you keep. The final version of the State Records social media guidelines will contain some further advice on this. Information governance frameworks should be core to social media strategies. capture long term value records for the organisation. Social media is such an opportunity for government service improvement and for genuine community engagement. But it is a risk to government if the transition of business to social environments is not supported by quality information governance frameworks. So work closely with others in your organisation to ensure good information governance operates across all areas of your business, including your social environments.